Other Company in Corning, Arkansas - Don't be ***! This company is a joke. I called just for the *** of it because I enjoy giving idiots a hard time. Spoke to a slick, fast taking rep named "Bill" and told him I wanted the "free" 3H as advertised on the NFL network. The scam started right away when he told me he just got swamped with calls from that very same commercial! Told me he call me back in 15 minutes, which he did. Remembered my name and everything which was pretty smooth. He agreed to send me the free club if I would just give him a CC # to pay for the shipping & handling. What?...am I ***? He then proceeded to sweeten the pot with offers of 3 fairway woods, a putter and a few other gifts if I would ONLY just give him my CC#. This would only cost me $133 per club plus S&H. I wouldn't do that and the guy actually got mad at me and called dumb for not taking him up on his offer. I'm thinking about calling him again just to **** him off. Don't do business with these people. Review #289140 is a subjective opinion of PissedConsumer289140. I work at an Independent living program and we teach young adults independent living skills. Our young man got hired at Wendy's at 1380 East Little Creek Road, Norfolk, Va.
23505. He started work on August 15, 2012. He was told that he would be trained and was given the hours to work. He came to work but was not told about the need for a food handlers card like we told him he would need. He had no training and was put on the cash resgister not the training one. He was put on the drive thru window. He didn't get a break and was on his feet the entire shift. Although he continue to work there this is not right. He has not yet seen the manager since the first day. He was put on the night shift closing. This cant be right. He has returned to out facility and told us stories about how he has been yelled at and messed up others orders because he didn't know what he was doing. What can you do. Wendy's should have put this young man on something like dining room duty(collecting the trays, wiping off the tables, and cleaning the trays.) I have a developmentally disabled adult daughter and she works at a Wendys, however, during the training period she had a job coach that taught her what to do. She has the dining room and is basically a greeter, too, because she is a people person. I call her their PR person. The independent living facilities where I live have job coaches that go out with the client for awhile, until the individual learns the ins and outs of the job, and then for awhile afterwards, the job coach checks in at the business to see how it is going. Review #289118 is a subjective opinion of PissedConsumer289118. Easy credit and pros. at there job. Nice experience. I got a Warranty , there follow up was very good , I have no complaints. I would highly recommend them. If you have credit problems they can get you a loan.I felt very safe doing business with them .They have a very homey environment and felt comfortable doing my transaction with them. In My purchase I never felt uncomfortable.If you have credit problems and need a "GOOD Dependable" car I would highly recommend to go see them. They have a very large inventory of good looking cars and trucks. Review #289080 is a subjective opinion of PissedConsumer289080. I bought this desktop PC 2-3 years ago. Blue screen always occur even i pay so much money to repair the computer, change the mother board, reformat the computer, everything!!!! when i almost completing my project blue screen occurs before i managed to save it! I had done everything i could just to stop this Blue Screen from occurring even it cost me a bomb but the Blue screen still Occur and always occur when i'm doing important project/assignment yet still occurring 10+times a week!!!! i'm really *** unsatisfied !!! !Another problem is the CPU usage always go really high even i reformatted the whole computer and IT IS THE MAIN CAUSE THAT MAKES BLUE SCREEN HAPPEN!!!! Review #289047 is a subjective opinion of PissedConsumer289047. I have been carrying this bag for just two days and it already feels like a closest friend. 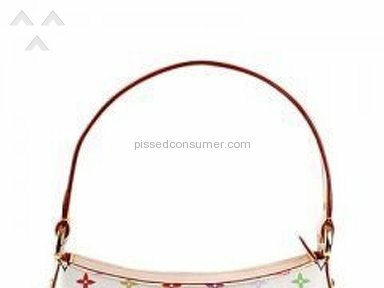 I have been looking for a similar bag with only one strap and like that the length is perfect for me. 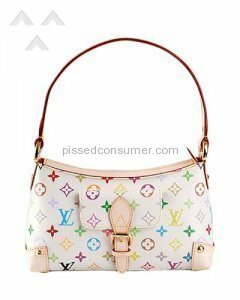 The Louis Vuitton Monogram Multicolor bag is really nice and lovely for me. I love the design and patterns on it. Review #289045 is a subjective opinion of poster. Bad service from day one. First our telephone and internet service were intermittent, and off more than they were on. This went on for months while they sent one service tech after another to try to fix the problem. Finally resolved after about 3 months, but meantime had talked us into "repair insurance", higher speed service, and a "bundle that was supposed to save us money, but brought more services that did not work and more equipment that they charged us for, even though we could not use it because of the problems, and continued to charge us for long after we returned it. When we called and tried to get credit for the non-functional services and equipment we got the runaround from one dept to another. We finally stopped paying the bill in order to get their attention, and all that did was get us even more runaround plus late charges and huge "service restoration" charges every time we talked with them, regardless of the fact the service was never shut off. DO NOT USE THIS COMPANY even if you have to resort to a TV antenna, dial-up, and cel phone. You WILL be gouged at every opportunity. Review #289014 is a subjective opinion of PissedConsumer289014. I was lead to believe that this was far less expensive. And I submitted payment, just last month [7/18/12], of $11.99 and do not know what was paid. Now I have a bill for $29.99 and have received no services. I want to cancel my subscription, please. It is not even a month later [today 8/12/12]. I sent an email to memberservices@cookingclub.com, to cancel my subscription, and received a receipt stating that I would be contacted within 48 hours, but I was not. This was listed as the only way to contact you. Please discontinue my membership. The number I looked up to contact you [ 888-858-8202] turned out to be a fax. Please discontinue my membership. Im, simply, paying for books, when they're sent, and I refuse to pay $42 for a book. Otherwise, I am paying for nothing. Please cancel # 54678668 membership. Wait, is someone going to contact me from this post? Thank you. Review #288985 is a subjective opinion of PissedConsumer288985. Review #288961 is a subjective opinion of PissedConsumer288961. do not buy or oder any thing this co is offering as they wii let other co. have your credit card no. as they did with mine and added charges that i did not auth. they lie about sending out shipping labels and had to cancell my credit card and now i have received mag. that i did not aurth. any co to enroll mThe co is keraniquee in. So do not give out your personal infor. Tryed calling but get only a *** machine!!!!!!!! !the co is keranique product did not work for me.... you will only talk to machine when ordering off of tv. Review #288914 is a subjective opinion of PissedConsumer288914. You have not contacted me for my permission to make any and all my personal information available to persons let alone the general public. I have not been asked or given permission to you or any other source to give or sell my information. I expect to have my name and information fully removed from your files. Your immediate action will be expected and appreciated. I am the Daniel Sheffler from Monterey, Tn. I read your terms and find it to be a bit confusing when you violate your own terms. I will be doing my own search of this PC to find if you are consumer approved. What????? Sounds like you're a nut case. Try contacting whatever company you are talking about DIRECTLY! Review #288889 is a subjective opinion of PissedConsumer288889.